According to the Centers for Disease Control, 37 percent of American adults can’t swim 25 yards (the typical length of a lap pool), and 10 adults drown each day in our country. With the onset of spring and summer just around the corner, pools, lakes and beaches will start to open for recreation. For those who can’t swim, water poses a limitation and drowning risk. If you’re one of these adults, there’s good news. The charitable arm of U.S. Masters Swimming (USMS), the Swimming Saves Lives Foundation, has declared April as Adult Learn-to-Swim Month (ALTS). Since 2011, the foundation has awarded grant funding to train instructors and offer adult swim programs across the country in an effort to reduce drownings. 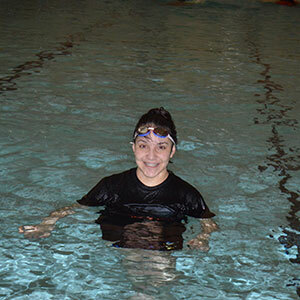 Oregon State University is one of those organizations, and the college’s Faculty Staff Fitness program is offering its second community swim program this April. This free course is open to any adult 18 years of age or older and will take place on the following days from 5-5:50 p.m. at the Langton Hall pool on OSU’s campus. These classes are geared specifically at teaching adults, which requires a different approach than teaching children to swim. Instructors are trained in methods that will help adults feel at ease in the pool. More than 15 participants learned to swim during last year’s inaugural program at OSU, including a handful of international students. All students who completed the program are now able to swim 25 yards on their own and some are now participating in water sports and have conquered a fear that once kept them out of the water. OSU’s ALTS coordinator and instructor, Drew Ibarra, says it brings him great joy to see individuals dedicate themselves to accomplishing a goal and then succeed. “I love that we provide physical activity programming in so many different areas for students and faculty, and the ALTS program is one area I feel we truly help to provide a service to the institution and community,” says Drew, who is also director of the college’s academic physical activity program.